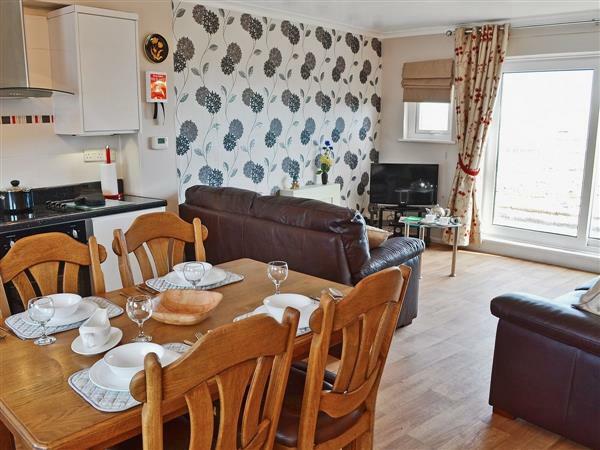 Bay View in Haverigg, near Millom sleeps 6 people. Bay View is a lovingly restored, three-storey terraced holiday home, situated on a quiet cul-de-sac in a central village location of Haverigg. Furnished and decorated to a very good standard, Bay View overlooks the river and Haverigg’s harbour, and has views across the 3 miles of sandy beach. In Haverigg, the village shop is open 7 days a week and caters for every need. The Harbour Hotel serves excellent bar meals, whilst the fish and chip shop has an adjoining cafe. Not far away is the beach cafe, which is also open all year. The nearby town of Millom is 1½ miles away, with a good range of shops, restaurants, cafes and takeaways. Walk to the Hodbarrow Nature Reserve and the RSPB hide and watch the many species of migrating birds which use this area to rest during their long annual migratory flights. Search for rare orchids and Natterjack toads on the dunes, which are a dedicated Site of Special Scientific Interest (SSSI). The Cumbrian Coastal Way, running through the village, can lead you north or south alongside the peaceful estuaries and inlets, with spectacular views all around. Water ski or wakeboard at Port Haverigg Ski Club. The market town of Ulverston, 20 miles, is a pretty Georgian town with cobbled streets and a Thursday market. Climb to the top of Hoad Hill for some spectacular coastal views. Nearby Coniston Priory is a Buddhist retreat with a cafe, gift shop and lovely grounds bordering the estuary. See the famous ghosts at Muncaster Castle, 12 miles, and also many rare trees and plants, or visit the World Owl Centre. Climb aboard the steam train ‘La’al Ratty’ at nearby Ravenglass and explore the beautiful Lakeland fells. Alternatively, travel to historic Lancaster or Carlisle. Both trips hug the beautiful coastline and provide a memorable day out. Georgian Whitehaven, 27 miles, has strong Caribbean connections, and this historic link has brought Cumberland Rum Butter amongst many more tasty culinary delights. Haverigg is situated on the Cumbrian Coastal Way in an unspoilt seaside location close to all the attractions of the Lake District. It is only 33 miles from Windermere and 16 miles from Coniston, and a world away from the crowds. An excellent touring base for the Lake District with quiet roads an added attraction, lack of crowds and a peaceful setting. Beach 10 yards. Shop, pub and restaurant 30 yards. Ground floor: 2 bedrooms: 1 double (5ft), 1 twin. Shower room with toilet. First floor: Living/dining room with patio doors/kitchen. Second floor: 1 double (5ft) bedroom with en-suite bathroom with shower over bath and toilet. Gas central heating, electricity, bed linen and towels included. Travel cot. High chair. DVD. iPod dock. Electric cooker. Microwave. Dishwasher. Fridge/freezer. Terrace with sitting-out area. Balcony. Parking (1 car). Welcome pack. Pets free of charge. No smoking. Holidays at Bay View run from Holidays run from Friday to Friday. NB: 12 external steps from balcony to ground floor. Do you want to holiday near Bay View (29901), you can see other cottages within 25 miles of Bay View; have a look to find your perfect holiday location.